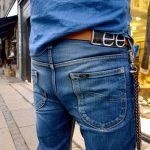 In this article, Swedish denim enthusiast Timmy Persson guides you through the 10 basic steps of making the pattern you need to make your own jeans. 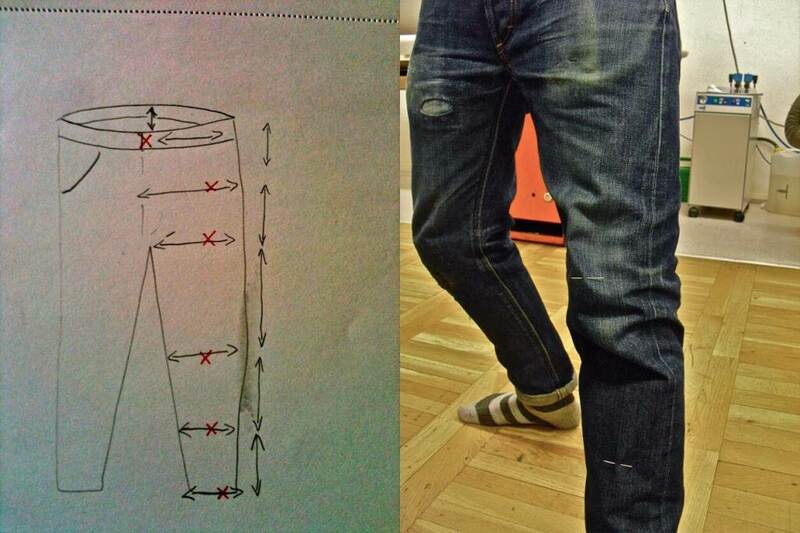 Timmy is not a trained patternmaker; to learn how to make jeans like a professional, check out these articles! The first thing you do is to put on your favorite pair of jeans. You then mark the center front of the waistband, the thickest area of your behind and thigh, the knee, the lower leg, and the hem. Then you measure the length between all the areas and the width on the marks from seam to seam and both on the front and the back. The pattern that Timmy uses as a starting point is a quite narrow fit. 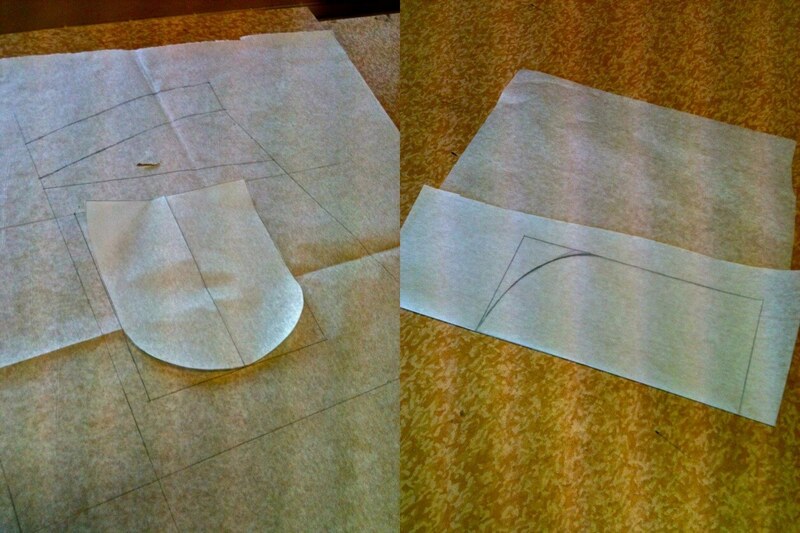 When all measuring is done, it’s time to start making the actual pattern. 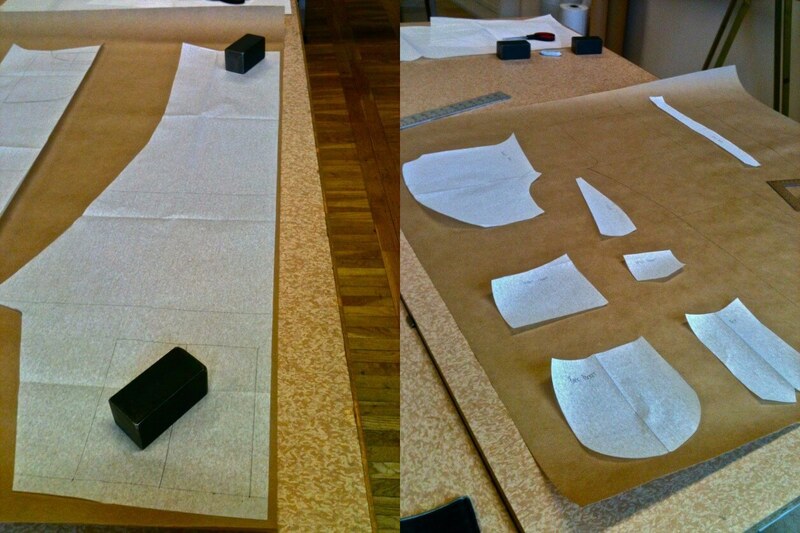 You start by adding all the measurements of the length to get the outer seam length. Since Timmy uses a selvedge denim he wants the outer seam to be totally straight. Therefore, he starts by doing two straight lines in the same length as the total amount of all the length points. Now you have the start of the front and the back. 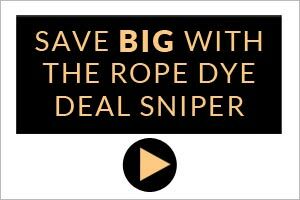 You start by adding all the measurements of the length to get the outer seam length. Since Timmy uses a selvedge denim, he wants the outer seam to be totally straight. Therefore, he starts by doing two straight lines in the same length as the total amount of all the length points. Now you have the start of the front and the back. You then place the marking points on to both of the lines. 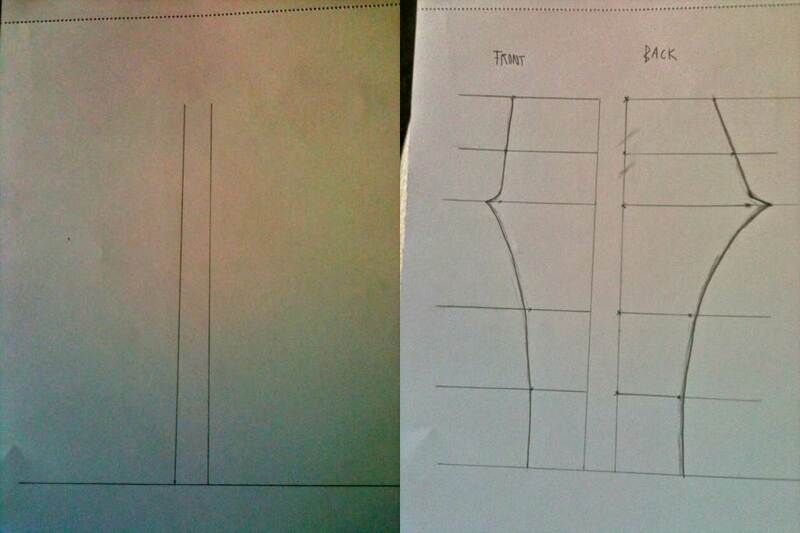 You draw out the width lines on the markings; the left line is your front side and the right line is your back. Then it’s time to shape the jean. You simply follow the markings that you have made. Be aware that it can be a little tricky to get the right shape on the back rise and the crotch seam. A good thing to do is to make a pair of “shorts” without details just to see if you’re on the right track with the pattern. As the cut of Timmy’s jeans is inspired by the early 20th-century style, he needs to reshape the pattern, make the crotch seam a bit longer, and lift the waist. Then, start shaping of the waistband. Timmy wanted it to be 3.5 cm, so he make some marks and then he just had to follow them. After that, shape of the front pocket, the fly, pocket bag, and also the watch pocket. On the back, Timmy put out his yoke together with the size and position of the back pocket. The shaping of the back pocket, he leaves till later. Now it’s time to re-draw the details on a new piece of silk paper. For the pocket bag and the fly, you double fold the paper before you cut it out like this. When you do your waistband you need to have a smooth transition from the back piece to the front piece, and when you re-draw it, you put them together. Next you have to shape the back pocket. Timmy chose a rounder look for his jeans. When all the pieces are cut out it’s time to put them on to a less flexible piece of paper: this will make it easier for you to draw the pattern onto the fabric. 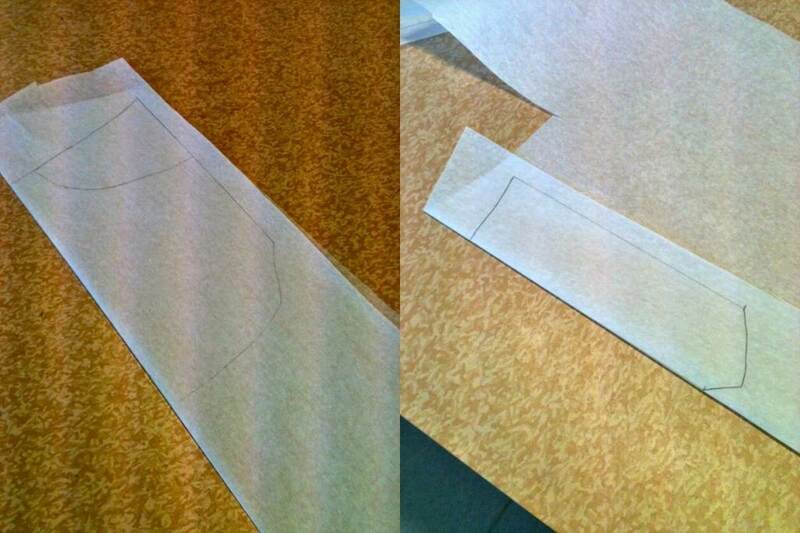 The last step is to decide on the seam allowance. The seam allowance that Timmy uses for almost everywhere is 1 cm; however, if you want narrower selvedge edge so there he used 0.7 cm. In places where he will be using a lap seam he uses 1.3 cm; and for the hem he uses 3 cm. 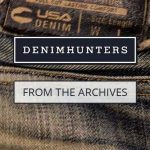 If you want to know more about how to make jeans yourself, check out our “how to make jeans” installment.